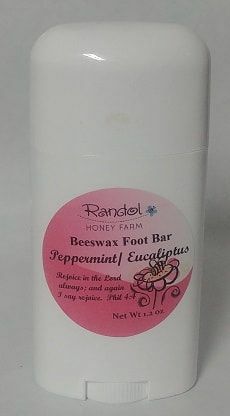 Peppermint/ Eucalyptus Foot Bar 2.25 oz roll up deodorant tube. Ingredients: Olive Oil, Cocoa Butter, Beeswax, honey and peppermint and Eucalyptus and Tea Tree/ Peppermint essential oils. Use this wonderful lotion bar on your heals and feet to soften them.